We get to see some pretty cool activations here in midtown Manhattan. Where else can you see a NASCAR pit stop one day and grass court tennis the next? In conjunction with Day 1 of Wimbledon, HSBC is launching a week of complimentary tennis activities in Rockefeller Center so we stopped by to check out some live tennis with Jennifer Capriati, Jim Courier and Luke Jensen. HSBC is in the second year of a multi-year sponsorship with Wimbledon. Last year, the firm activated by in-store footage, sweepstakes and branch visits throughout Manhattan by Monica Seles and Jim Courier. 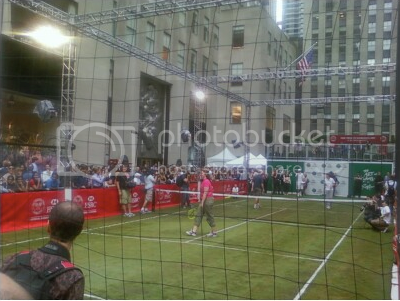 This year they've taken the game right to Rock Center (complete with ball boys, grass divots and an umpire stand). "With this event, HSBC is bringing a bigger and more authentic taste of Wimbledon to New York City," said Kevin Martin, Executive Vice President and Head of Customer Marketing, HSBC Bank USA, N.A. HSBC has more than 100 branches throughout New York City. Leveraging Wimbledon (which on-site at least, is perceived to be a heavy hospitality-driven sponsorship opp) to bring unique experiences to a global footprint of key markets is a good example of how activation can be used to reach varying constituencies beyond the core on-site audience. Right now, especially for financial services, this is more important than ever. Financial institutions, rightly or wrongly, are under increased pressure to prove the value of their sponsorships - beyond the cozy confines of corporate hospitality that is. HSBC recently decided not to renew its title sponsorship of the New Zealand PGA Championship, but still says it is committed to the sport as a key sponsor of pro golf events throughout the globe like WGC-HSBC Champions. Can and will future golf commitments be leveraged in similar ways? Live Wimbledon Screenings: Catch exciting match play daily on a giant screen TV from 7:00am to 5:00 pm, followed by classic tournament footage until 7:00pm. Tennis fans can enjoy their lunch or take a break while watching the action from a special seating area. Public Grass Court Play: Challenge friends to a match on the singles grass court, trimmed to Wimbledon's official 1/8" length. Tennis sneakers are required; Prince racquets and balls will be provided or players may use their own equipment. Prince Sports, Inc. Tennis Clinics: Passerby can get tips from certified Prince tennis pros on June 23 & 24 from 11:30am- 1:00pm and 5:30- 7:00pm, and on June 25 & 26 from 1:00- 2:30pm and 4:00- 5:30pm. Photo with the Wimbledon Trophy: Through green screen technology, fans can pose with the Wimbledon trophy and walk away with a memento photo. EA Sports(TM) Grand Slam(R) Tennis game: Play EA Sport's new video game at kiosks in the viewing area. Sign up on-site for a "Grand Slam(R) Tennis" tournament to be held on the big screen on June 25 at 5:00 pmwhen the official Wimbledon broadcast ends. Strawberries & Cream Carts: Try a traditional English treat! Complimentary samples of strawberries and cream will be distributed between 12:00 pm and 6:00 pm daily, courtesy of California Giant Berry Farms. History of Wimbledon: Learn about the heritage and evolution of the world's most famous tennis event, from the grass courts to Wimbledon whites to the new roof that allows match play in all weather. HSBC also will unveil a "Champions of Wimbledon" mural by acclaimed artist Rolf Harris celebrating winners through the years. HSBC Cab Rides: Be on the lookout for the HSBC London cab. Johnny the Cabbie, HSBC's popular cab driver, will be driving through the streets of Manhattan offering complimentary rides to Rockefeller Center activities. City Parks Foundation Tennis Clinic: On June 23 at 3:30pm Jim Courier will host an invitation-only tennis clinic for children selected by the City Parks Foundation, part of HSBC's ongoing sponsorship of the Foundation. Courier will take participants through a number of tennis drills and a Q&A session. California Giant Berry Farms will provide healthy strawberry snacks, Polo Ralph Lauren will outfit clinic attendees. What do you think about the activation play? Curious about HSBC's sponsorship criteria?